A group of neuroscientists looking for the parts of the brain responsible for higher forms of cognition has made a breakthrough by comparing how information spreads on social media. The team scanned the brains of 40 research volunteers in Switzerland, then mapped the regions and long-range connections in each one before applying a dynamic model for information spreading based in part on work done to try to predict which memes on Twitter will go viral. The results showed a global view of the brain's information architecture. 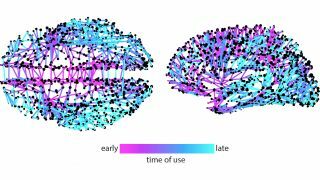 "This study suggests that answers about where in the brain higher cognition occurs may lie in the way that these areas are embedded in the network," said Olaf Sporns, who is senior author on the study. "You can't see this just by looking at a static network. You need to look at dynamic patterns." Interestingly, however, it wasn't the viral components of the model that were useful. "The viral distribution of information may be considered good online, but it does not accurately describe the normal functioning of the brain," said Yong-Yeol Ahn, whose Twitter work the model was based on. "The model we used for networks in the brain reflects a decidedly non-viral form of information spreading." The next step for the team is to explore the role of individual differences in brain networks, and find out how brain abnormalities may affect its ability to distribute information. "To get a global understanding of how the brain works as a complex networked system is a major goal in our field," Sporns said. "We've hit upon something that is both promising and relatively simple, a model that may help us get better insight into why certain things happen in certain parts of the brain and not others. Much remains to be done; we've only scratched the surface."